"I use content and technology to build brands and grow companies." Over the last two decades, Avi Savar has helped the worlds leading organizations drive change by leveraging digital as a transformative force to build and grow their brands. In 2004 Avi founded Big Fuel, a global digital marketing agency, which he would grow from a one-man shop to a dominant industry leader with over 130 employees worldwide. Over the next decade Big Fuel consulted with the world’s leading brands, including: American Express, GM, Budweiser, Samsung, Gatorade, Colgate-Palmolive, Fisher-Price, Weight Watchers, AFLAC, T-Mobile, Carnival Cruises and more. Big Fuel was acquired by the Publicis Groupe in 2011. In 2014 Avi established Savar Ventures, an advisory and investment firm, and also joined venture capital firm Dreamit where he currently serves as Partner and Board Director. Most recently, Avi was named President of consumer intelligence platform SUZY in 2018. Being touted as 'Siri for brands’, SUZY has secured over $15 Million in venture capital to-date from investors that include: The Foundry Group, Tribeca Venture Partners, NBA star Kevin Durant and fashion icon Kenneth Cole. Avi continues to be a leading expert who consults and speaks globally on digital strategy, disruptive technologies, business transformation and corporate innovation. He is the author of Content to Commerce (published by Wiley) and was named the inaugural President of the Cannes Lions Branded Content Jury in 2010. Avi is an active advisor and investor in several media and technology companies and currently sits on the advisory boards of American Express, DCP Midstream and AgAge’s Publisher’s Council. “The pace of disruption has increased exponentially. You can instantly explode in value or be destroyed and disappear." Every company across every industry is impacted by the exponential rate of disruption and the technology that enables it. Today, innovation happens in months, not years. Companies that don't keep up with the pace of change risk being disrupted. Avi works with forward thinking business leaders and executives to effect change from the top down. These organizations are ready to challenge the status quo and motivated to make the necessary changes to secure a better future. Look at the research, data, insights and historical context shaping these trends and learn about the startups that are using these technologies to disrupt industries. "Comfort is the enemy of growth. I tend to make people uncomfortable." Avi speaks globally at conferences, trade shows and events on trends in digital media, disruptive technologies and corporate innovation. He has been featured on Fox News, Forbes, Mashable, Business Insider, TechCrunch, VentureBeat, the New York Times and is a contributing editor for Inc.
Over the last decade, the convergence of media and technology has turned the marketing world on its head. In order for brands to succeed in today’s hyper connected world, they must think like a publisher and act like a media network. 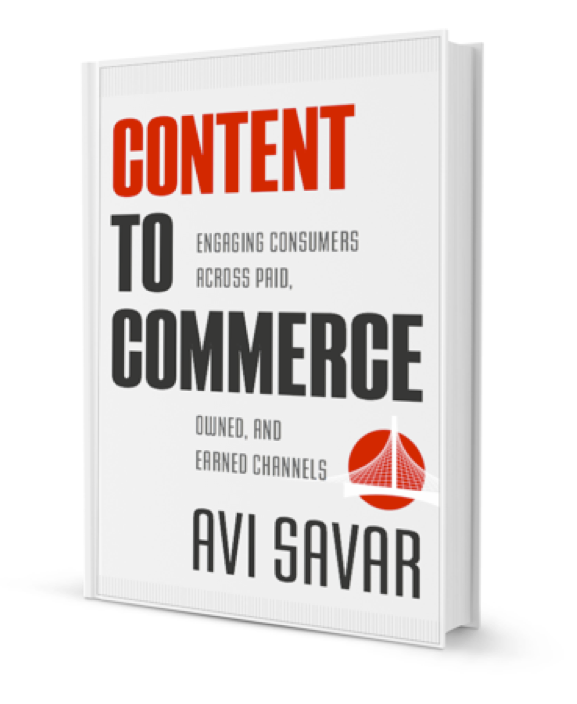 Content to Commerce, by author Avi Savar offers a clear approach to help big and small brands fuel stronger relationships with their consumers.